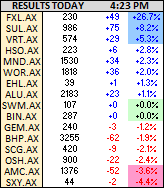 ASX 200 down 61 to 6284. Politics the focus. Turnbull survives for now. Banks ease on franking fears. Miners wilt as BHP disappoints. 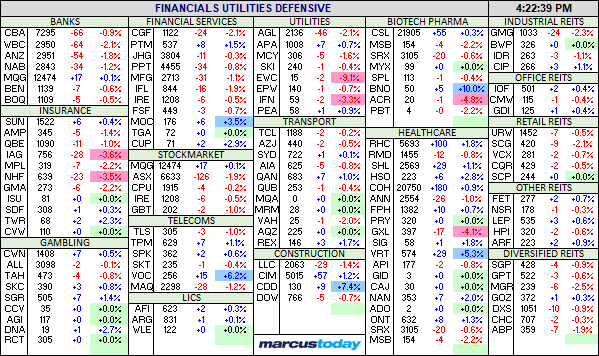 Energy stocks weaker on No National Energy Guarantee. AUD firms on RBA minutes to 73.53c. Aussie Gold firms slightly to $1624. US futures up modestly by 19. 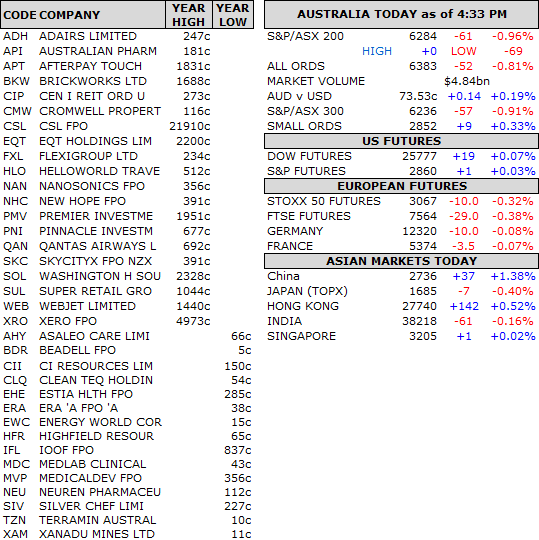 Asian markets mixed with Japan down 0.40% and China up 1.38%. 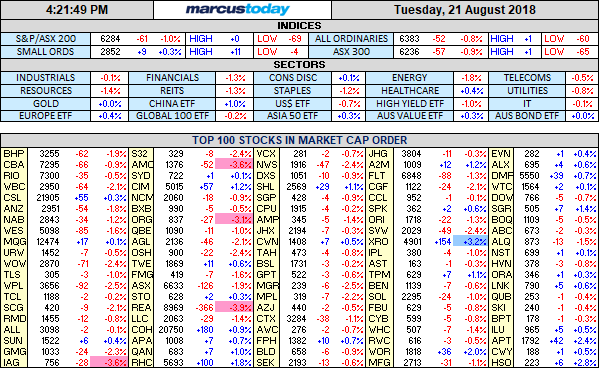 MARCUS CALL – Hot stocks not to be trusted. Plus, an interesting income stock. TRADING IDEAS – One new trade. No stop losses raised. SMALL COMPANIES – One addition to the portfolio following a result this morning and good to hear back from a chairman of a company we own to clarify some concerns. CDD +7.44% bounces back after yesterday’s fall. VOC +6.22% telcos drawing interest. WGX +3.85% gold stocks find support. APT +2.40% steam still building. XRO +3.24% back to hero. SGF +5.03% takeover talk on ECX focusses upside. AAD -1.11% weaker ahead of results. REA -3.92% CEO sells holding. RFG +24.07% up 50% in four days. Dogs are barking. 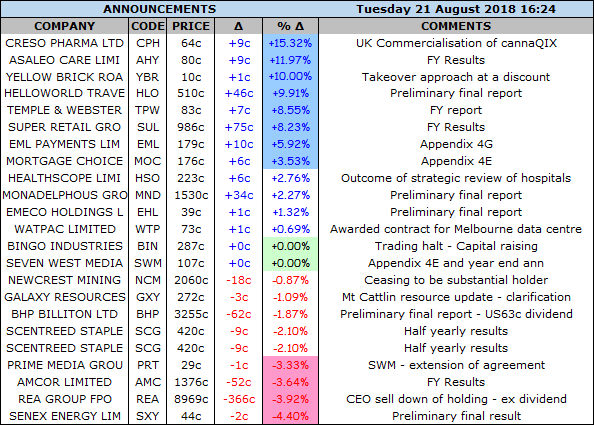 Results 28th August. CAT +7.66% good bounce on thin volume. CVN +9.72% rethink after fall. BIN – trading halt pending acquisition. Speculative stock of the day: 4DS +15.0% good vibrations continue for revolutionary chip maker wannabe. 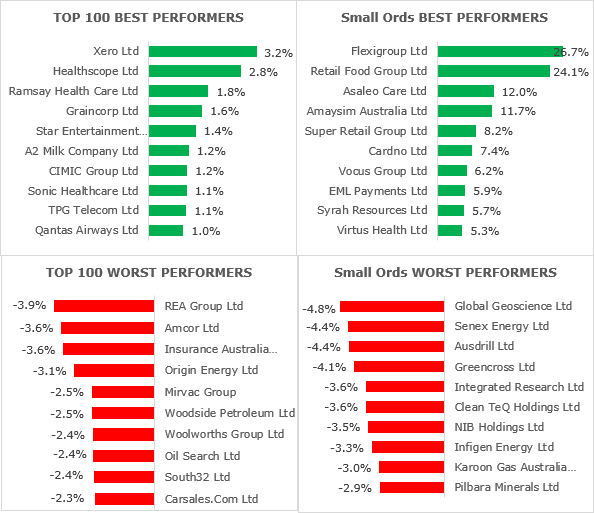 Biggest risers – SUL, VOC, SYR, XRO, HSO. 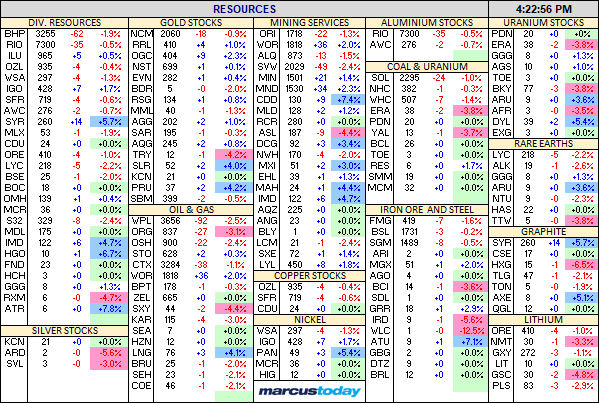 Biggest fallers – ASL, GXL, REA, AMC, IAG. BHP Billiton (BHP) –1.87% Underlying net profit from total operations has missed consensus expectations of US$9.18bn, coming in +33% on year to US$8.93bn. Statutory net profit fell 37% on year to US$3.71bn impacted by a US$5.2bn impairment charge on US shale assets and a US$650m loss tied to Samarco. Net operating cash flow grew 10% on year to US$18.5bn driven by higher prices and volumes with production records at nine operations. A record final dividend of 63c per share brings the full year distributions to 118c per share, a 42% increase on year. FY19 guidance was cautious sighting a number of macroeconomic factors. It included, productivity gains of circa US$1bn, total copper volumes are to be flat and total iron ore production of between 241Mt-250Mt in FY19. Capital and exploration expenditures were +25% YoY to US$6.75bn, within guidance of under US$8bn, which is expected to remain constant into 2020. The CEO also highlighted, once complete, the net proceeds of the US$10.8bn sale of its onshore US business are expected to be returned to shareholders. Oil Search (OSH) -2.39% First half profits fell 39% to US$79.2m ($107.7m) on sales that were 18% lower at US$557.8m. Oil Search declared an interim dividend of US2c, as expected, down from US4c a year earlier. PNG earthquake has taken its toll. Flexigroup (FXL) +26.72% After tax loss of $10.3m from $87.4m last year. Total portfolio income fell 1% to $460.4m Final dividend of 3.85c fully franked. Seven West Media (SWM) – Net profit of $135.8m compared with a loss of $744.3 last year. Revenue dipped 3.2% to $1.62 billion, underlying EBIT fell 9.9% to $235.6m and underlying EBITDA dropped 11.7% to $270.9m. No final dividend. 2c last year. Super Retail Group (SUL) +8.23% Revenue was up 4.2% YoY to $2.57bn, NPAT was up 26% YoY to $128.3m as all divisions contributed to the growth. 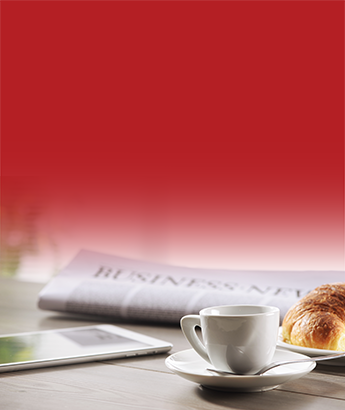 A final dividend of 27.5c was declared bringing the full year dividend to 49c per share, up 5.4% on year. Amcor (AMC) –3.64% FY18 Results. Net profit up 21% YoY to US$724m, however after accounting for the impact of one-off items and currency changes the annual net profit was slightly down at -0.2%. Revenues up 2.4% to US$9,319.1m with volumes in the North American beverage segment modestly increasing. A final dividend of US$0.24 per share. The company expects solid earnings growth in FY19. Emeco (EHL) +1.32% announced a net profit for the full year of $11.4m from a loss of $180.5m a year ago. Revenue for the period rose 94.4% to $381m. Profit after tax excluding significant items was $20.1m from a loss of $90.9m a year ago. Asaleo (AHY) +11.97% Underlying EBITDA of $46.3 million and underlying Net Profit After Tax (NPAT) of $17.8 million. The Company recorded a statutory Net Loss After Tax (NLAT) of $101.5 million. The statutory result includes non-cash non-recurring charges of $148.5 million relating to impairment and write-down of assets. Dividend NIL. Class (CL1) +3.85% NPAT up 9% and a 14% increase in EBITDA. EPS up 8% to 7.4c with a SMSF market share of 27%. Fully franked div of 2.5c.Class Portfolio continued to grow this year and had 5,949 billable accounts as at 30 June 2018 (30 June 2017: 3,254). 31% of Class Super subscribers are now using Class Portfolio. The Super Reforms have increased the need for Class software and we expect they will have a positive impact in the longer term. Bingo (BIN) – FY profits up 91.6% to $38m. Revenue up 43.8% to $300.2m. 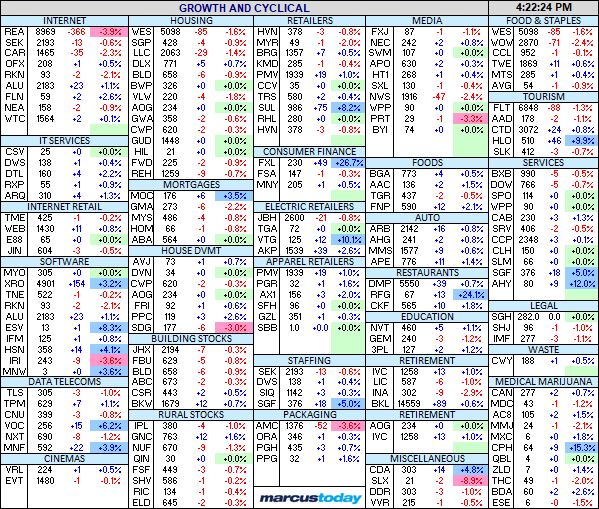 Final dividend of 2c. The company also announced an acquisition of the Dial a Dump for $577.5m. $377.5 in cash and $200m in shares. The acquisition will be funded by a 1 for 2.48 pro rata accelerated entitlement issue at 254c. CHAMP private equity considering selling out of its Lorna Jane stake after conducting a strategic review. 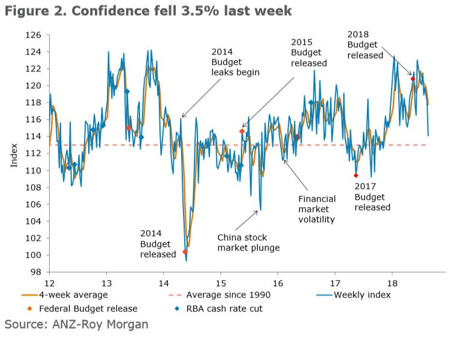 The ANZ-Roy Morgan consumer confidence index fell sharply by 3.5% last week. RBA Minutes – Nothing very different here. Theme remains the next move on rates is up but some way off. For the full announcement click here. Members noted that the global economic expansion had continued. 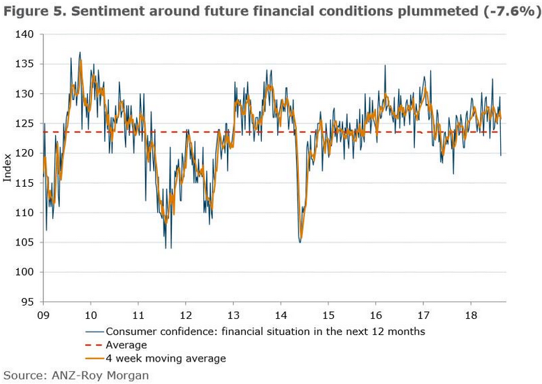 Global financial conditions had remained expansionary, although they were gradually becoming less so in some economies, most notably the United States where the Federal Reserve was expected to increase the federal funds rate further over 2018 and 2019. Forward-looking indicators of labour demand, including vacancy rates, continued to point to above-average growth in employment in the near term. The forecasts for the Australian economy were largely unchanged. GDP growth was expected to be a little above 3 per cent over 2018 and 2019, supported by strong public demand, resource exports, further growth in non-mining business investment and steady consumption growth. NAB has taken a look at China’s trade deficit with US and EU. 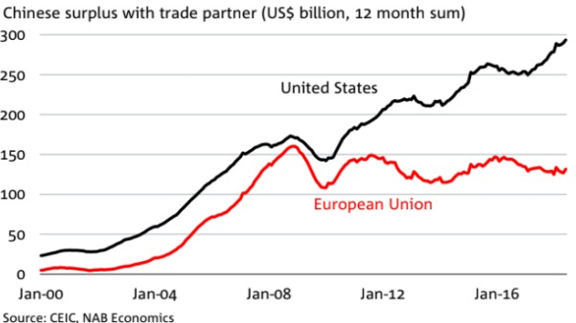 US surplus twice the size of EU probably on the back of more tepid economic environment in EU. Venezuela knocks a few zeroes off its currency in 95% devaluation. Officials were warned 6 months ago about the Genoa bridge. JP Morgan cuts Tesla forecast on lack of funding clarity. Germany about to announce the world’s largest current account surplus. Possible target for Trump. POTUS accuses China and EU of currency manipulation.